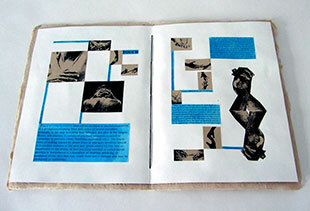 Evelyn Eller: "Experimenting with the book format was a natural outcome of my work in paper collage. In my books I use traditional structures as well as sculptural and innovative forms. 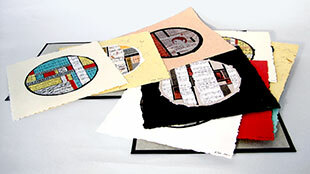 Handmade, oriental, and painted papers, book cloth, string, boards and glue are my materials. these materials are fragile yet durable." New York: Evelyn Eller, 2016. One-of-a-Kind. 14" x 10"; 4 pages. Bound in paper covers with sewn binding. Signed and dated by the artist. Evelyn Eller: "Much of our experience with art is now digital. In this book, I tried to give the viewer an experience of seeing and holding a book that had a tactile feel. I incorporated text about touching, images of hands touching, sheets of Braille and textured papers in the construction of the work." New York: Evelyn Eller, 2015. One-of-a-Kind. 10"x 7.5 "x 2" closed, extends to 42"; 6 pages. Accordion fold. Pages extend from bottom of box with pull tie. Wooden box with metal hinges and metal snap closure. Cancelled stamps. Signed and dated by the artist. Evelyn Eller: "A few years ago, I acquired a large amount of postage stamps from the daughter of a stamp collector. I didn't know if they had any monetary value, but I wanted to use them in my art work. 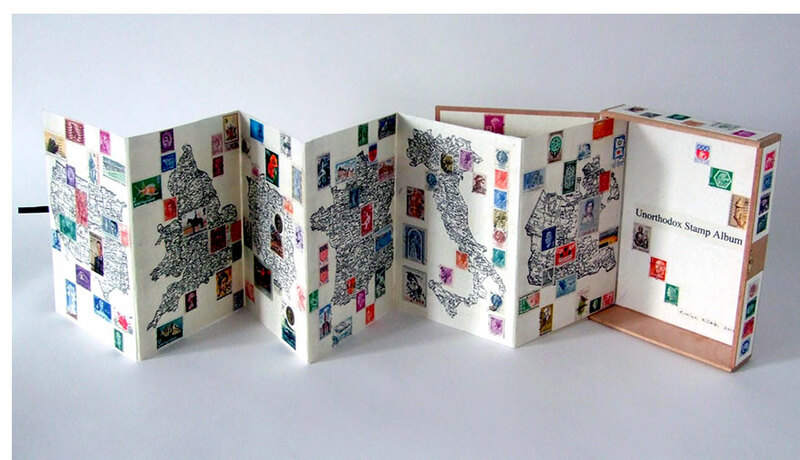 I created a mixed media collaged artist book, using photocopies of maps and original stamps from the United States, Italy, France, Poland, Canada and Great Britain. Stamp collecting is a vanishing pastime. This book is my way of commemorating the Stamp Album. " New York: Evelyn Eller, 2002. One-of-a-Kind. 13 x 13"; 12 leaves. Laid in cloth covered four flap portfolio with bone and ribbon loop closure. 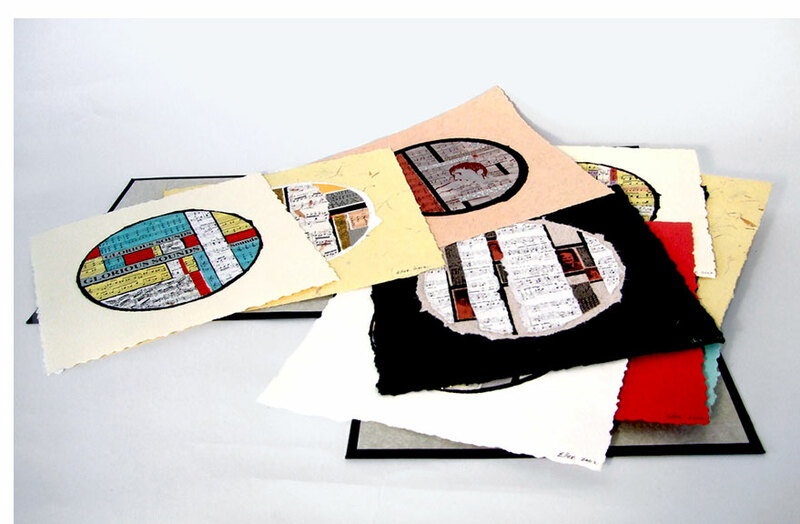 Each collage signed and dated by the artist. 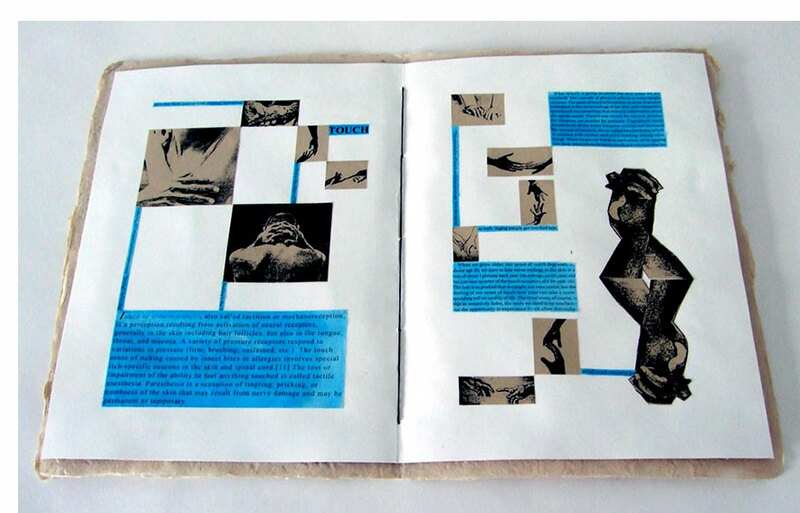 Evelyn Eller: "In this book, I used 12 of my original collages, which I created on handmade papers in 2002. The pages contain fragments of written text, musical scores, and photocopies of images of conductors, other musicians, and of my husband who was an avid fan of classical music. I always listen to WQXR, which is a radio station that plays classical music, while I am working in the studio. The folio is a homage to the glorious sounds that we hear when we listen to music."